On Friday, I did myself proud. As many of you know, I write feature articles for a nail salon industry magazine. Every July, my fabulous editor asks her writers to propose ideas for the following year. Last year as a part of my 2009 article proposal, I came up with the idea of interviewing the host of one of my favorite business makeover shows in conjunction with an article about salon makeovers. (Click here to hear his glorious British accent and see what his personality, full of infectious excitement, is like. He’s awesome!) I let my editor know that I would do my best to locate his PR people and get an interview secured while she was considering my article idea. (I figured, worst case scenario, if she didn’t like my idea and I already had the interview arranged, I could write a differently-angled article and pitch it elsewhere. As it turned out, she loved the idea.) It was super-easy to get connected with the person at the network who could arrange the interview. In fact, my contact at the network said to me, “Are you in LA? I could arrange a sit-down.” WHAT? I was tempted to look at the family finances and check into swinging the cost of a ticket just so I could say, “Yes, I’ll be in LA in two months, how about then?” But alas, I came to my senses rather quickly and let him know that it would have to be a phone call. He told me that we’d schedule it closer to when I needed to write the article, and we said goodbye for now, agreeing to reconnect in June, this month. My excitement over this huge “get” (isn’t that what Brian Williams, and all of those big-time journalists call their exclusive interviews?) was tremendous. Until I realized one thing. I am a complete idiot when around celebrities. Here’s some history for you. This was when the show was huge, and we were huge fans. Of course our mom was all for running over to her to say hello and ask for an autograph or something. I only remember a few things about the moments that followed. We did go over to her. I literally don’t remember anything else about that whole exchange, except that even at age seven, my sister was completely at ease with someone we idolized. 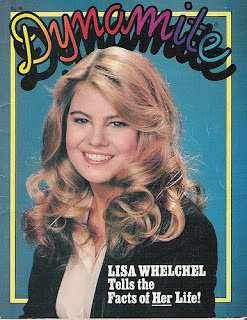 Even though I can’t remember specifics, I’m fairly certain that I could tell you that she was downright polished when having this conversation with Lisa Whelchel and it would be true. Fast forward to another experience with someone we both adore, during which I was a (say it with me!) Complete Idiot. Anyway, whenever David does readings, whether it’s in a big theater like that night or in small bookstores, he stays afterward to sign books and chat with the fans. On that night, Julesie and I were excited to get in the book signing line. (This, by the way, would be the first of three Sedaris meetings. We are groupies.) As we inched closer and closer to the table where he sat, tirelessly signing and chatting (it seemed like most everybody in the theater was sticking around! ), I grew more nervous. I felt myself freezing up again! But the worst was yet to come. My loved ones ridicule me for it We still talk about it to this very day. Those four little words lingered in the air for what seemed like an hour. 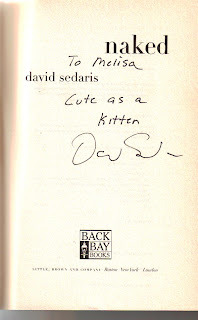 That candy is long gone, but the memory of how I told David Sedaris that I don’t like cats will last a lifetime. I have done progressively better with David, and I believe that on the next visit I will feel confident enough to ask him to meet Julesie and I for a late-night book discussion over Starbucks. I think at my ripe old age of forty, I may have finally realized that, deep down, celebrities are exactly like “real people”; they just have a different job. It’s about time. *At another booksigning, he was offering everyone a two-pack of Tylenol, because we had been standing in line for so long. Congrats on the 'get' and for a successful interview. Loved the book inscription. He called you Darlin'! Did you just melt???? I'm Glad it went so well. Weaselmomma: I totally even forgot to put a link in so you can hear his adorable British accent! I'm going to edit now…go back and look! Way to go, Darlin'! Oh, and after mom asked if Lisa Whelchel was Lisa Whelchel, you did stand there frozen like Cindy Brady… and I, your 8 year old sister, said, "Well, she wants your autograph!" Then, Lisa signed one for each of us, I said thanks, and we walked away. You didn't speak for about an hour. Too funny! You crack me up! I'm so glad you got the "get"! Julesie: That's probably the longest period of time I've ever not spoken. Ever. I don't like cats. Bwahahaha, Melisa. I can't get over that. Tooooo funny! Congrats, too – that's big news! Wait, what happened to the part where they had to call you back becuase they weren't ready for you? Glad it went well for you though! And… I have to say that I've heard that first story before (ok, the first two stories), but … they still crack me up! I'm glad you got your "get." Congratulations on a successful interview. Thanks for sharing your background with the rich and famous! That was funny! Yeah, I'm the same way around famous people. I guess it runs in the family, huh? My not knowing much pop culture I would so not recognize most celebs and so if I somehow talked to them I would have no idea they were anyone "special" lol. I think it depends on the celebrity for me and the vibe I get from them. Like- I met John Goodman in Popeye's once, and I talked to him like he was a regular guy. When I met Rachael Ray, I was so excited that I had trouble writing things down, but when it came to talking to her, it was like we were old friends! but I totally get it. I've had it happen before. It's weird how that happens, isn't it? I love the cat story. I can see how that would haunt you for a while. I have never met a celebrity but when I do I will let you know how it turns out. I don't really like cats either. I love the Cindy Brady reference! I can just see you freezing up! I am a regular person, so no freezing up when you meet me next month, ok? I am the VICE CHAIR of our school committee, but I still hang with the average folk! You'll have a limo waiting,right? Bwahaha! You. Crack. Me. UP. I just love how you’re never shy about sharing your most embarrassing moments with us. It makes you human, makes us feel better about what “we” may or may not have done at a red light (think: singing…loud) and I would love to see a “where are they now?” picture of you doing the Cindy Brady face, today. You up to it, Scrawlsie? Um, MAYBE. Coincidentally, I AM going to see the real Cindy (and Bobby) Brady in person at my theater tomorrow night. I don’t know yet if I will pay the $20 for a picture. If I do, I may make my best Cindy Brady face.